Same pear, new medium. 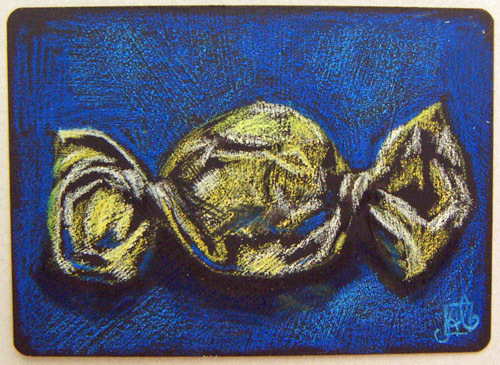 This time some old fashioned (dry) pastels. This pear still stands on my desk and I feel pretty sure, that I won’t eat it. Some random facts about pears: did you know that pears contain Vit. B1, Vit. B2, Vit. B3, Vit. B5, Vit. B6, Vit. B9, Vit. C, Calcium, Iron, Magnesium, Phosphorus, Potassium and Zinc? Unfortunately they also contain sorbitol, which causes to those who are very sensitive to it abdominal pain and diarrhea. Bastet (also spelled Ubasti, Bast or Pasht) was an ancient feline Egyptian goddess of war. She was highly revered, especially in the lower parts of Egypt. Originally she had been depicted as a lioness, but later generations turned her image into that of a domestic cat :). This is my very first attempt at painting an artist card. 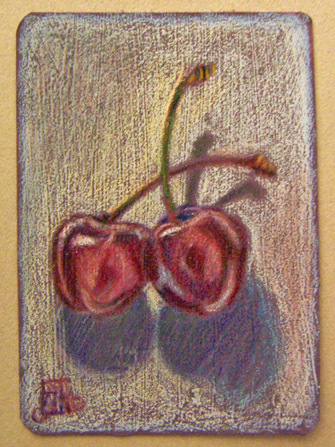 With oil pastels it is a quite difficult thing to get details done while working on such a small size (2,5″ x 3,5″). Nevertheless I had much fun doing it. 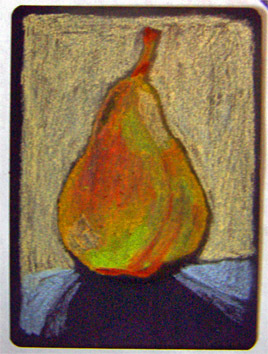 You are currently browsing the ACEO category at : silviasblog.com :.